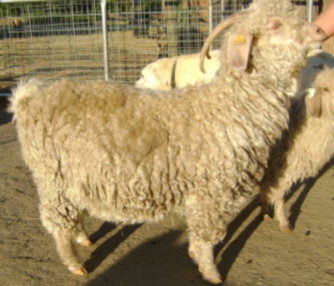 Candy: (Sire: T.C., Dam: Button) a white registered color carrier doe whose father was a Texas Champion registered white. She is a twin, born 4/09/2005, very curious and really likes treats. She has a very dense, somewhat greasy fleece that simply glows when washed. Hers is probably one of the best fleeces in my herd. She has produced white kids but her offspring should produce color and great fleeces. Her mother produced blue when bred to recessive bucks.